Close to Da Nang the peninsula landscape includes white beaches, crystal clear water, forest covered mountains and coral reefs just beneath the sea surface. The numerous beaches include North, South and Buddha beach. Also known as Monkey Island the best views can be had from the mountain top as you look down on Da Nang City, the turquoise sea and clean beaches below. The tombs are not far from Hue and are spread out along the banks of the Perfume River. It’s one of the most popular places to visit in Viet Nam and I personally think the most beautiful of the tombs are Minh Mang, Khai Dinh, Tu Duc, Thieu Tri and Dong Khanh. The tombs were built according to religious outlines including symmetrically balanced geometrical angles and symbolic motifs. Each tomb has its own character with surrounding gardens, small bridges and walkways. In the Khai Dinh tomb you can see intricate ceramic and glass work and it is perhaps the most beautiful of the tombs. 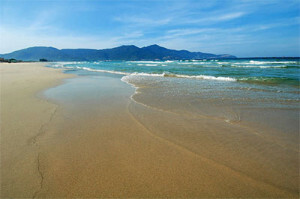 The beautiful beaches of Viet Nam deserve a place on this list. A few years ago Nha Trang was one of the most popular beaches in the country, but for a more pristine and tourist free beach try Phu Quoc Island. Apart from the dense inland forests the coast of Phu Quoc has long stretches of white sandy beaches and translucent water. The beauty continues under the water in the surrounding coral reefs. The 99 Peaks mountain range covered with unique plants, trees, waterfalls and inhabited by seldom seen indigenous animals are the best place to see the island from. The fertile land around the delta has allowed plant life to run wild, apart from the agricultural opportunities the delta offers untouched nature reserves. Explore the river life of floating markets and small villages as well as the islands close to the delta mouth. The beautiful landscape includes rice paddies, small rivulets and water channels meandering through the countryside towards the sea. Sapa is a mountain town in the northwest of Viet Nam known for its picturesque mountain scenery, green valleys, quaint traditional tribal villages inhabited by the ethnic minorities, bamboo forests, rice terraces and breathtaking views. The best view of Sapa can be had from the Tram Ton Pass or Heaven’s Gate, the highest mountain pass in Viet Nam. Also in the area is the Bac (silver) Water fall, if you have the energy continue up the Fanispan Mountain for a truly magnificent view. As yet unspoiled by tourism this is one of the beautiful hidden gems in Viet Nam. This nature reserve is recognized by UNESCO and is the location of Son Doong, the largest cave in the world as well as another 300 caves and grottos. Within Son Doong is a 13 meter long underground river and beautiful stalactite and stalagmite formations. Other significant and beautiful caves in the park include Tien Son Cave, Thien Duong Cave and the Vom cave system. The unusual and beautiful rock formations are due to the area being in a 2000km square limestone zone. Enjoy the tropical vegetation and evergreen forests with 500 year old trees. Within the still waters rise up out of the water 3000 island limestone formations in all manner of shapes and sizes. The water is often covered in mist giving it an eerie atmosphere. The Karst limestone formations can be seen by taking a cruise in a traditional wooden junk, you can also canoe or swim here. There are some beautiful caves in the small islands which are lit making the area even more mysterious. In the heart of the capital city of Hanoi the One Pillar Pagoda was built in 1049 to resemble one seen in Emperor Ly Thai Tong’s dream, this dream like Buddhist temple appears to float above a lotus pond. It is built of wood and stands on a small single pillar, the temple is designed to look like a lotus blossom and has ornate beautifully painted carvings. The One Pillar Pagoda we see today is a reconstruction of the original which was destroyed in war. Not as often visited as other beautiful places in Viet Nam this hidden gem is a natural wonder formed from volcanic basalt rocks which appear to be sculptured columns of different heights. As if created by an artist millions of years ago the volcanic eruption met with the water and cooled forming these unique naturally made sculptures. The phenomenon has remained untainted by tourists as it’s a little out of the way in An Ninh Dong Commune in Phu Yen Province. Once the hub of the Nguyen Dynasty the tranquil collection of temples, ceremonial gates, streams, moats, pavilions, bridges, gardens and pagodas make this a beautiful site with plenty to see. The Thai Hoa Palaces and the Truong Sanh Residence are two of the most beautiful structures here as well as the ornate Thien Mu Pagoda isolated over the river. The beautiful city displays the essences of Vietnamese artistry.